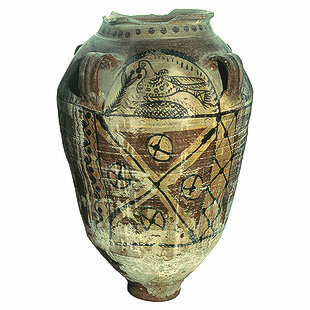 The zeir, or big jar, is decorated with Coptic symbols including fish, crosses, and plants. The artist divided the painting on the jar into two sections. A third area near the base is not decorated. The first section includes the neck of the jar, adorned with a Nile fish. The second section is divided into many scenes separated by columns and adorned with intersecting geometric lines in the form of a branch of plaited ornamentation. One scene shows a bird eating from a branch. Beneath the bird is a cross with four circles around its sides. Each circle contains a cross, which represents life. In the middle of the cross is a coffer, a chest for money or valuables, with a simple circle. The other scenes contain a collection of geometric ornaments in the form of spiral lines and a three-leaved lotus flower, which symbolizes resurrection and eternity. The spiral lines extend down beneath the flower, with five circles on each side because the figure 5 signifies providence. A wavy line like the hieroglyph for water in Ancient Egypt circles the jar below all the scenes. Water is a Coptic symbol of life and chastity.